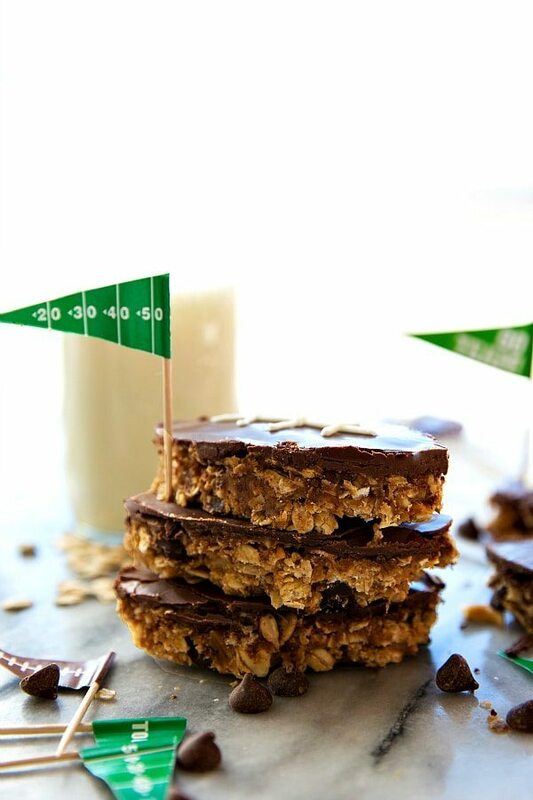 The best no-bake granola bars made to look like footballs — perfect for tailgating! Optionally topped with chocolate and football lacing. How many of you have been following and enjoying the NFL football season?! The husband has been following it pretty closely. He’s currently participating in fantasy football which is based off the real players’ performance in the games. Every single week I get an update on how he’s doing and where the team he has picked is placing so far. 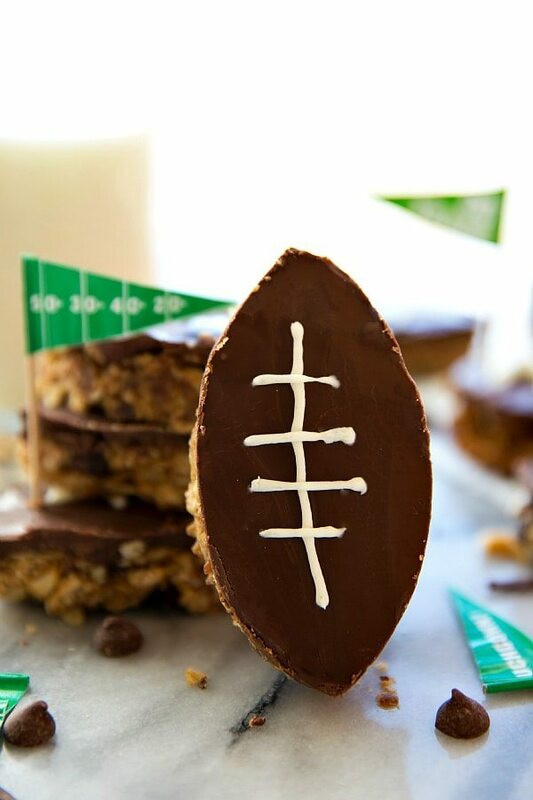 These football-shaped granola bars are super simple to make (hello, no baking!) 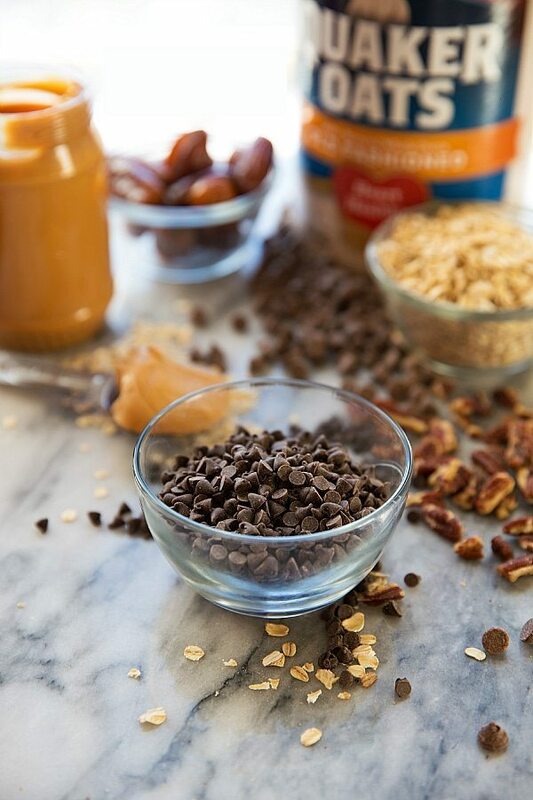 and full of flavor while also having tons of wholesome ingredients. I got the idea to start with dates for granola bars from these delicious granola bars by Minimalist Baker. I’ve made those granola bars a few times before and LOVE them, but I’ve always liked granola bars just a bit thicker. So I made a few changes to increase certain ingredients, added in quite a few different ingredients, and changed the flavor a bit with the chocolate topping. A few batches later, these are what I’d consider the perfect no-bake granola bar! The mix-ins can be changed to whatever you like best as long as they stay relatively small. I tried one batch with regular-sized chocolate chips and they didn’t hold together as well in some places once they were cut up. Same with larger nuts. I chopped down the nuts, used sunflower seeds, and miniature chocolate chips in my favorite (and last test) batch. If you don’t have miniature chocolate chips and still want chocolate in them, chop up a chocolate bar or chocolate chips. And if you aren’t even a chocolate fan (?) you can completely replace the chips with a different nut, raisins, dried cranberries, etc. Since these don’t require any baking make sure to measure the ingredients carefully so you have enough liquid to dry ingredients as that is what ensures these stay together. It’s also super important to really pack/press the mixture together and down into the pan. And finally to let them sit and chill. They need time to set up which is perfect if you have the chocolate topping that needs to set up anyways, but if you opt to NOT have a chocolate topping then still let them chill in the fridge for at least half an hour. Okay, ready to see an assembly video of these granola bars? In a small blender jar (I use the Twister jar for Blendtec) or a food processor, pulse the pitted dates to create a very thick and sticky paste. Stir in the "additions" I generally use toasted sunflower seeds, mini dark chocolate chips, and chopped toasted pecans or cashews. BUT as long as you keep the quantities consistent you can use pretty much whatever. Just keep the size small or the bars tend to be more crumbly. With regular sized chocolate chips they didn't hold together as well as with miniature. To toast your nuts (recommended if you like the flavor of toasted nuts but not required!) heat a frying pan on the stove top over medium-high heat. When the pot is hot, add in the nuts in a single layer (no need to add anything else). Stir until the nuts begin to become fragrant and slightly deepen in color. Watch carefully as they go from perfectly toasted to burnt very quickly and easily. Remove from the pan immediately into the bowl. Stir in the toppings and knead with your hands to get it all well mixed. 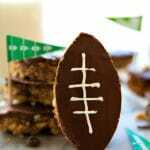 Remove from the pan and if desired cut them into footballs with a football cookie cutter. Cook time refers to "chilling" time. These are so cute, Chelsea! 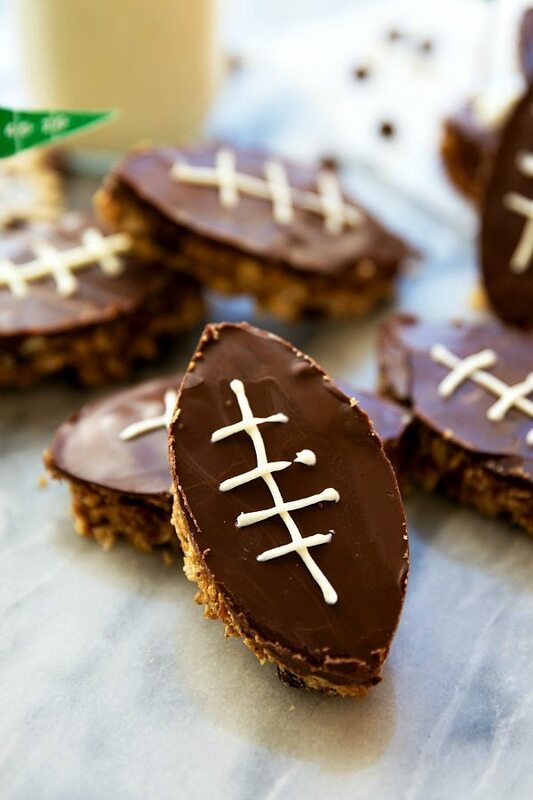 What a fun (and adorable) tailgating treat! Just one question, how sweet are they? I ask as I haven’t tried baking – or no-baking in this instance – with dates before. These are so adorable Chelsea! These are so cute! My favorite thing about football is the food that goes with it! 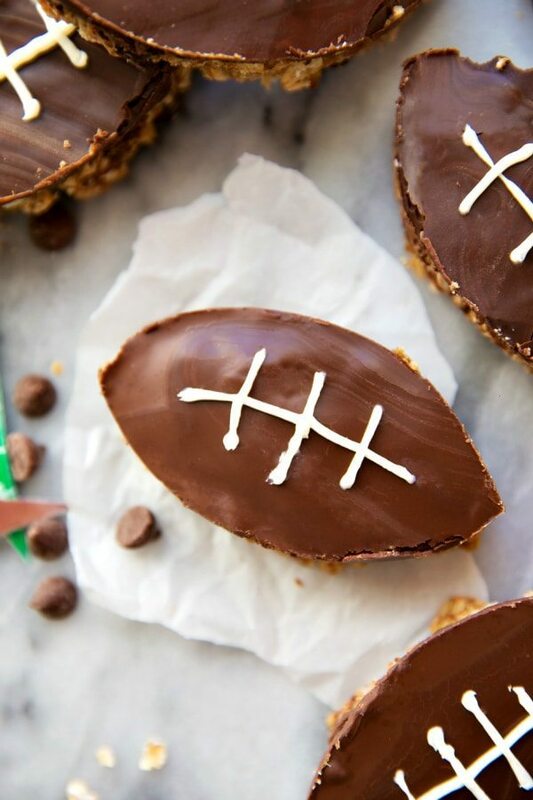 I’m not much of a sports fan, i just like the party atmosphere, so these are right up my alley! I am always looking for a good granola bar recipe, so pinning this! Wauw! These look great! Just wondering how long you can save them if you don’t eat them all in once ? Thank you! They actually last pretty well if stored in an airtight container in the fridge; up to 2 weeks!